We wish to invite you to celebrate the life of Bro. Anthony Lim Teong Keat, a stalwart of The Church Of Jesus Christ of Latter-day Saints in Malaysia, who passed away peacefully on 14 February 2018. 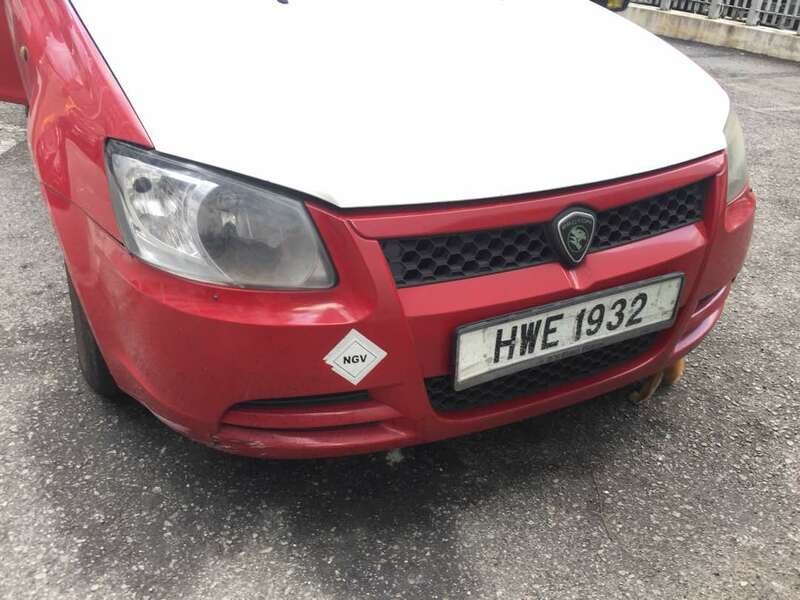 We will be holding a viewing this Tuesday, 20 February 2018, from 8:00AM - 11:15AM at PJ chapel, 2 Jalan 52/4, PJ New Town, 46200 Petaling Jaya. Following the wake, we will be commemorating his life at the chapel from 11:30AM. 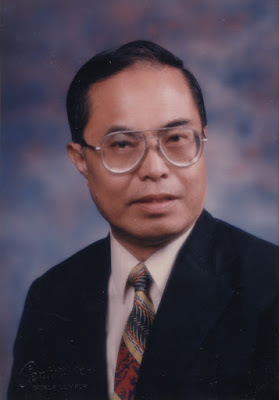 We will then proceed to the burial grounds, where we will dedicate the grave at 2:30PM at Kwong Fook Cemetery Sungai Besi at Sungai Besi, 43200 Kuala Lumpur. We will conclude following the grave dedication & there will be no subsequent event thereafter. Thank you and hope to see you on Tuesday. This "In Memory" post is created from my heart and mind as the author of this blog that started for my own family that later extended to friends who when become close to you, is also regarded to become like family to me! Hence my often used cliche that "Family and Friends are Forever!" This post will be linked to an Easter Memorial post that I created some time ago to include my family, friends and some people I may not have ever met before but have 'departed' whom I like to keep in remembrance of with the joy of Easter that gives hope to me that I can personally meet them again one day. Some photos of Anthony's life and brief historical information of the Church in Malaysia will follow. 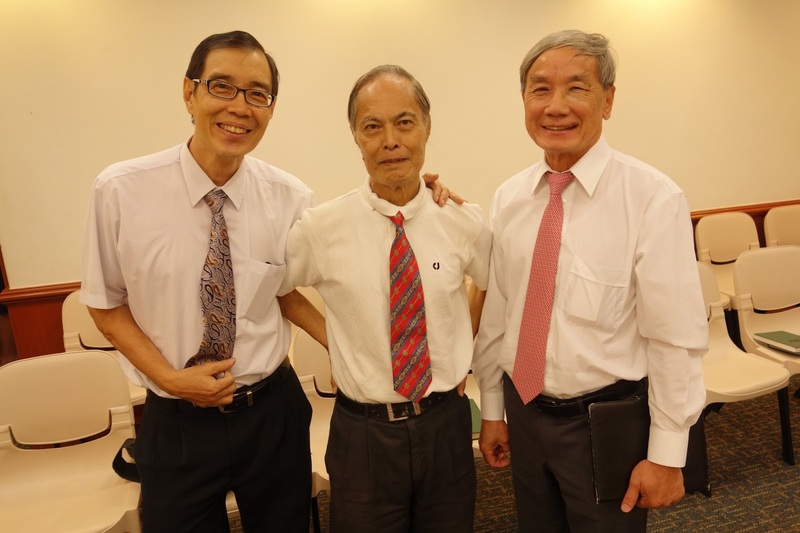 This is possible as Anthony Lim was a true pioneer of our Church in Malaysia who faithfully served the Church in his own country and kept the faith till his very last breath. This is in spite of all the challenges that he or any man can face in life! Being well versed in the English language and having a passion for writing, he became a newsletter producer and a natural historian for the Church in Malaysia. Much of the content of this post is only made possible by referring to Anthony's written record with details here. 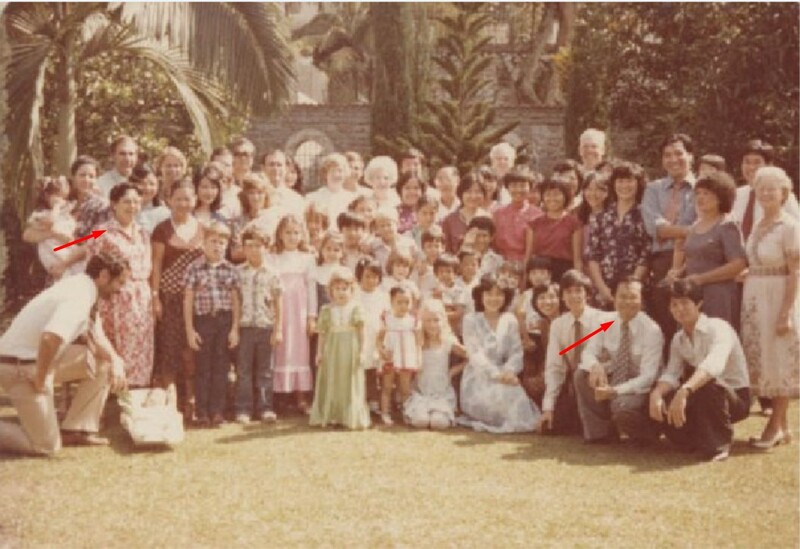 The older photos are sourced from either Anthony himself when he was living or friends living in the same generation in the beginnings of the Church, with names indicated, while the later ones from 1980 onwards when I came into the stream of his life are from my own albums. 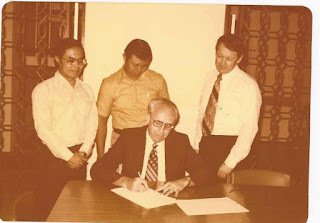 Captions for the old photos are extracted from Anthony's historical documents in my hands or from those sent to me from other pioneer members of the 70s era. I am grateful for social media technology that makes the creation of this 'In Memory' post possible. 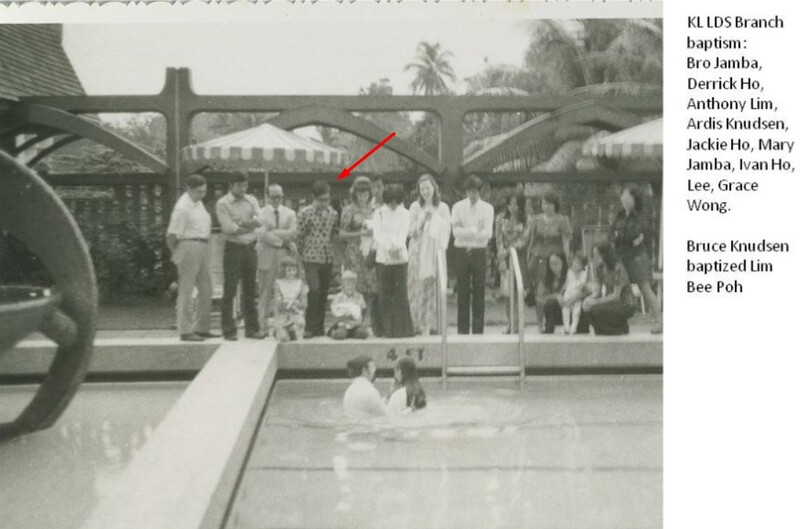 After a year of study and prayer, Anthony Lim was baptized at the Merlin Hotel pool, later known as the Concorde Hotel, in Kuala Lumpur on 3 December 1972 at 6.30am by his cousin Jon Lim. He is officially the first member in Kuala Lumpur to be baptized while a member up north named Thee See Bah was baptized the previous year in Penang on 26 July 1971 where there was a Church group made up of primarily Australian members from the Royal Australian Air Force. He is now living in Hawaii. Anthony joined the Church group meetings that started at the YWCA in 1973 for the next 6 years in Kuala Lumpur, photo courtesy of Jackie Ho living today in the US. Anthony at the baptism of Bee Poh by Bruce Knudsen, photo courtesy of Jackie Ho. 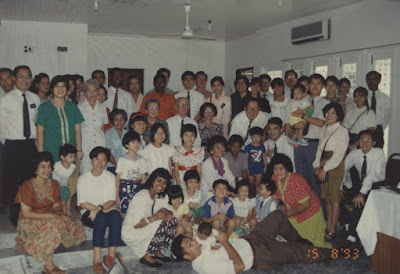 Family Home Evenings were organized at his home in Happy Gardens that started on 29 July 1974 as per the historical record of the Church kept by Anthony. Photo courtesy of Jackie Ho. 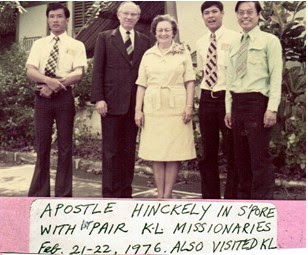 Notes of Anthony with Gordon B. Hinckley, then an Apostle seen in Singapore and a mention that he did visit Kuala Lumpur too. Sep 2 - Final signing of documents of the incorporation of The Malaysian Church of Jesus Christ of Latter-day Saints under the Company's Act - with John Peterson, Lafe Shumway, Anthony T.K. Lim and Rodney B.L. How as directors. 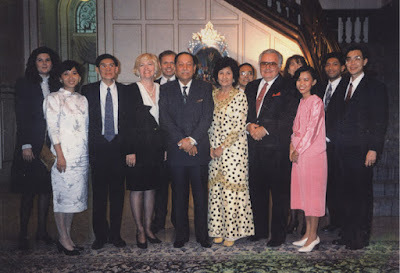 I first met Anthony Lim when I came back to Kuala Lumpur after I had completed my tertiary education in Australia. 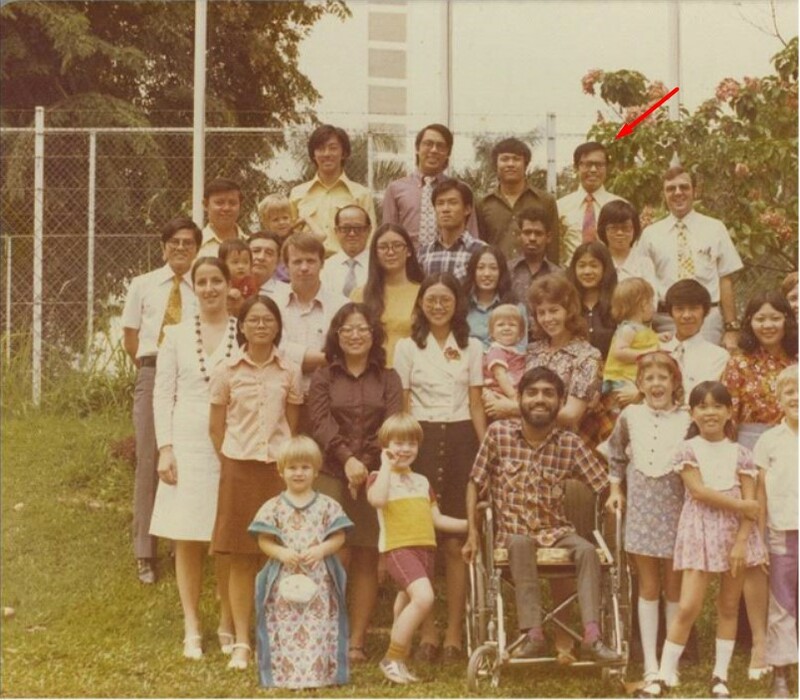 I came home for the Chinese New Year celebrations in Feb 1980 prior to receiving my call as a full-time missionary to serve in the Singapore Mission, reporting to the MTC in New Zealand on 5 Aug 1980. The above photo was taken after I had returned to KL with David Soon, my mission companion, to serve as full-time missionaries. The members in KL branch had moved from the YWCA to start meeting in the new Church-owned property in Petaling Jaya sometime in Jan 1979. The arrows point to Anthony on the right and my mother on the left who followed me to Church when I had first returned home. She decided to take missionary discussions with the missionary couple Elder and Sis Stoker as recorded in this journal post. 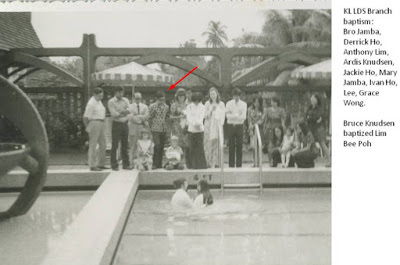 I had returned back to Australia for my university convocation and she was baptized on 22 Mar 1980. 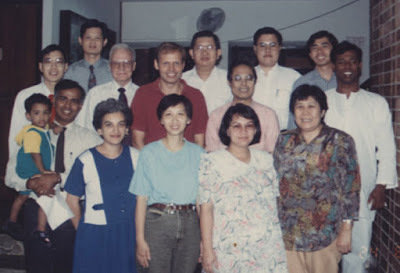 The lady on my mother's left is Sis Cheah who was our first convert whom be baptized who was our landlady who rented a room to us in PJ as shared in this journal post. Anthony lived closed by and would often visit or give us rides when we didn't have a car yet. He was also showing himself to be a good missionary in fellowshipping with Sis Cheah and even my mother. 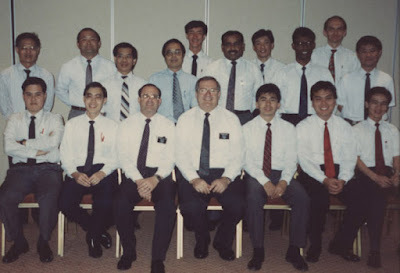 Anthony in this year was also called as the first Branch Mission leader in the KL and we worked even closer to him to help in the missionary work of the branch. 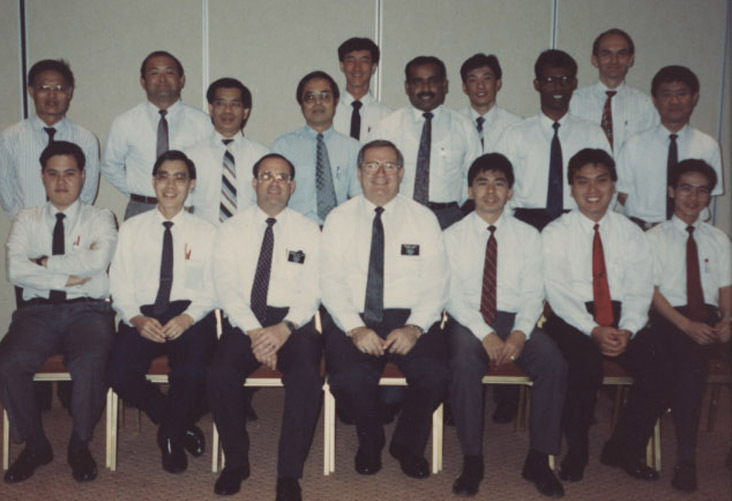 He had served as the Branch Mission leader till 1990 for ten years where over 24 members were baptized at one particular year(record), the average being 9-12 per year. Pres. 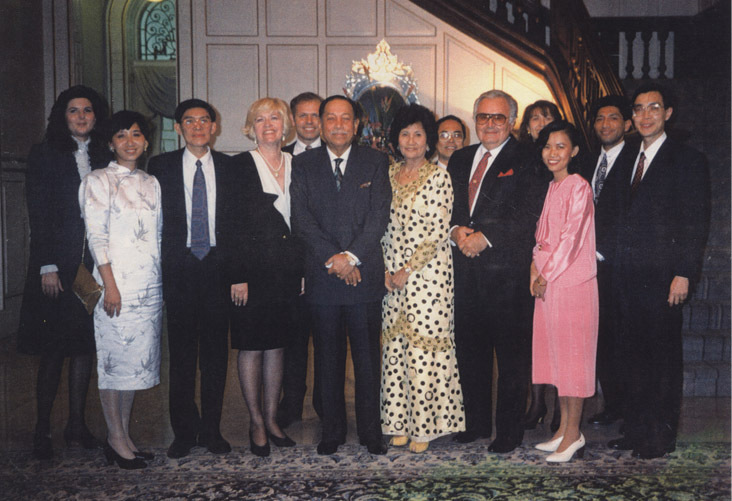 Carmack, the Asia Area President set Anthony Lim apart on 10 Jan. 1993 as the National Director of Public Affairs. He was always active to make contacts and arrangements for events of our Church in the public. 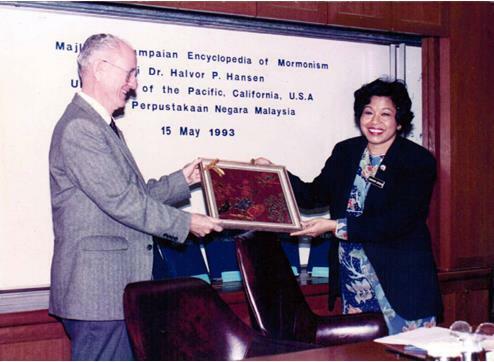 May 5- Bro Anthony Lim, the National Director of the Church Public Affairs for Malaysia had arranged 5 volumes of the Mormon Encyclopedia to be presented by Prof Halvor P. Hansen from the University of the Pacific, California to Puan Mariam, Deputy Director of the National Library in Kuala Lumpur. Aug 15- Anthony is seen on the far left, on the occasion of Ipoh branch members now having their own church-owned building for their use. Apr 8- District Council meeting held in the PJ meeting house presided by President Gary Orgill as counselor of the Mission Presidency with Anthony seen on his left. 1994 May was the Branch Conference in Penang with the presence of District officers visiting from KL. 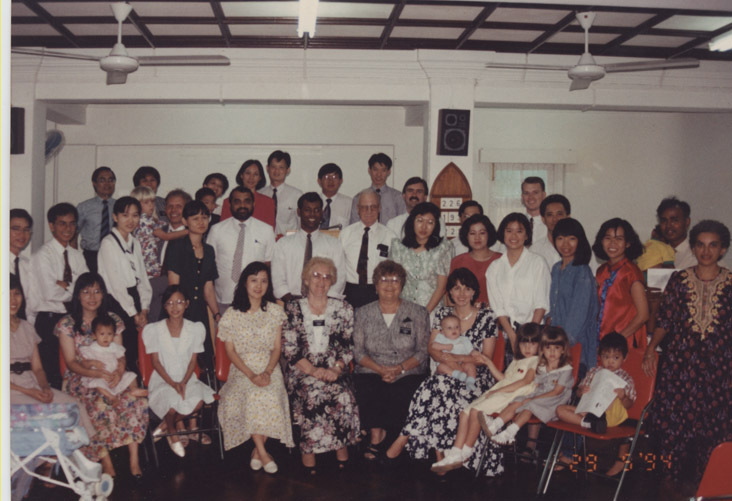 The photo is taken inside the branch building, a renovated bungalow that the Church had purchased and was dedicated by President DeLaMare of the Singapore Mission on 7 July 1987. Anthony is seen in the left back row. Sep 28- Royal Dinner Invitation (Japanese Menu) at the King’s Palance in Kuala Lumpur with the King of Malaysia, Tunku Ja’afar, and Queen arranged by Bro. Vincent & Sister Sandra Gordacan of Las Vegas. They knew the Royal Family for 27 years through Sister Sandra. Also present at the Dinner were Pres. Gary Orgill and wife, Marcia, Pres. 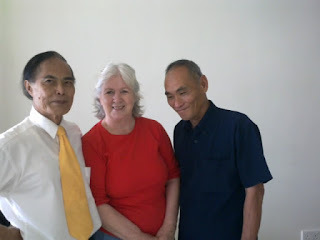 Chong Sun Fu and wife, Geok Lee, Pres. Ivan Bee Ho and wife, Sophia and Bro. Anthony Lim. (On the Left back of the Queen) At the end of the Dinner, Bro. Gordacan thanked the Royal Couple for the gracious invitation to get to know the Church Leaders. 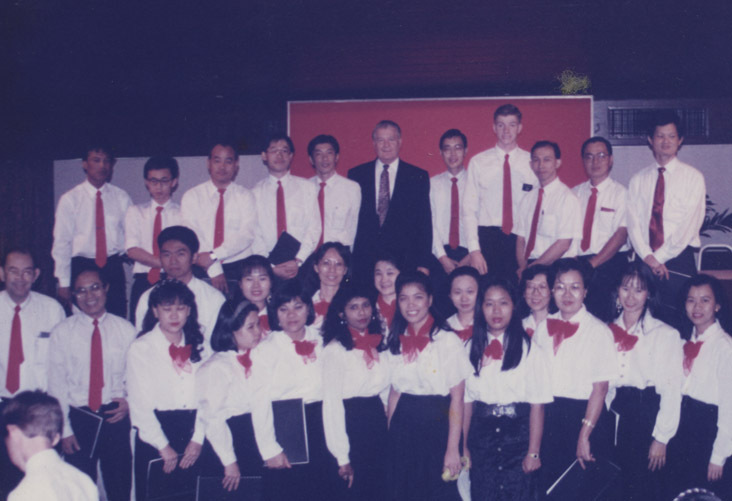 December District Conference in Kuala Lumpur where John H. Groberg was the visiting General Authority with Anthony Lim seen in the front row 2nd from the left. 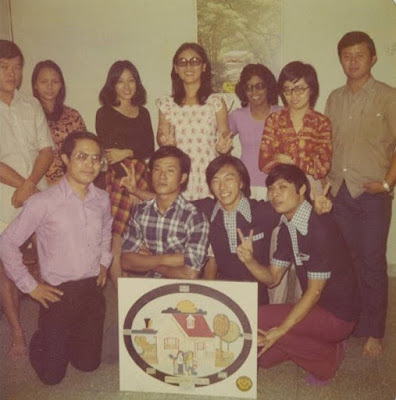 Anthony Lim as the 1st National Director for Public Affairs held exhibitions on the theme "Strong Families can hold our World Together" in Kuala Lumpur and Penang. A uniformed Church Choir also sang in public shopping centre of Sungei Wang Plaza, Kuala Lumpur and Assunta Hospital, Petaling Jaya for Christmas. 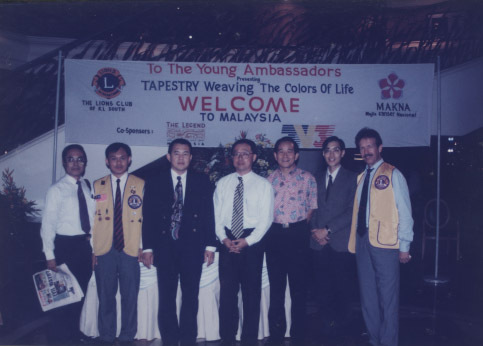 In May, a public event to keep Anthony busy is the Young Ambassadors Tapestry performance where the Church worked with the Lions club to raise funds for building a cancer hospital led by MAKNA. 2005 Dec - Reunion with an expat family visiting KL again, the Forsyth family. Jaszlyn is growing fast! That life on earth is like a particle of sand. Such immensity of space and time you see! Lest we may fall for anything or nothing. As commissioned to record those things of worth. You are only in the service of God's call. You are only doing it to Christ so dear. What matters most are taken into account. In the Book treasured biography of you. God loves to see your smiles though you may be mad. How the angel record this important task? He notes them with keen observation always. But things which matter not disappear from you. With the Lord's strength, your victory is not in vain. Do what pleases our Lord and truly win. Keeping us safe by His Spirit really? For their mighty works and mercy, well-done! Of all your thoughts,words, and deeds that are true. How you wish you could have done even more. When you enter the Celestial golden door. Cheer up, son, while there's life, let's strive to excel! On past shortcomings and sins you sorely spent. Wake up, and pledge, “I'll live my life for Christ, mom. You stand firm on your belief the best ever. To excel those things which are divine and pure. Age is not a factor in eternity! For making peace and love with God at your best. When you know the true God and Christ He has sent. As saviours on Mount Zion we strongly hold. More abundant life, peace and joy be assured. His son Elisha served a mission in Ogden Utah from 2002-2004. 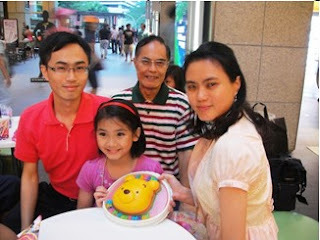 Jaszlyn was baptized on 20 Sep 2009, making her a 3rd generation Mormon in his family! She is 17 years old today on the passing of her grandfather! 2011 - While he was still in KL branch, foreign visitors like Michael Simpson above would love to take a photo with him as the first member baptized in Kuala Lumpur and really the oldest pioneer member from Malaysia who is still serving the Church to the end in his own country! 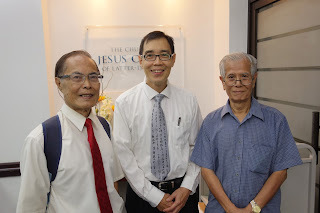 Even when he moved to PJ at a time I had to shuttle between KL and Singapore, wherever I meet him, he is always seen as positive and encouraging other members at Church, some of whom are from overseas too. The Last Farewell....Till we Meet Again. Elisha dedicated the gravesite for this father. We bade our last farewell to him and felt peace and love in our hearts. 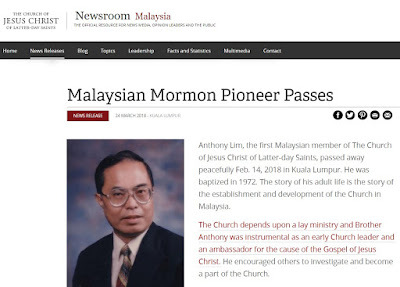 Here is something I like to share in this memorial blog post of Anthony Lim. In my short talk at the funeral service that can be reviewed above, I said only a few words mentioning that my talk can be lessened in time as all I like to share can be viewed on this special post for brother Anthony. This was the taxi that was booked for Anthony to go from PJ to visit his old parents' home in Sentul where only siblings are left today for a Chinese New Year visit. Along the way, he felt like vomiting and told the driver to stop by the side of the road. After doing it, he went back into the car and the journey continued. He told the driver that he felt sleepy and would lay down on the back seat to rest. As they were approaching the home the driver tried to alert Anthony but there was no response. So the driver tried to touch him to wake him up but found that he was already cold and stiff! He called Vivien to explain what had happened. How peacefully he passed away without any pain or struggles or a need to be suffering pain or receiving endless treatments in a hospital prior to his death. He was seen at Church the previous Sunday as normal so Bro Anthony was truly blessed to be able to leave so peacefully. Now Vivien had related this to me a couple of days before the funeral service. She asked me what did I feel about the number of the taxi, whether it was anything special? So I started adding the numbers up 1+9+3+2 which equals 15. Add 1+5 further to get number 6. Hmm... I thought I might get my lucky number 7 which I have a lot of stories written about that starts here called the Story of 7. 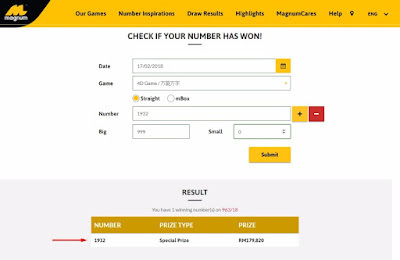 Well for some reason, to respond to Vivien, I quickly googled number 6 to find this site which says, "Regardless of your beliefs, 6 is a powerful and unique number which definitely reminds us to keep our thoughts and actions as positive as possible." Wow to me it sounded like the character of Anthony Lim I know, always very Positive indeed! The number did come out but maybe not first prize but it did come out at the next draw where one could win $179,820 if you bet BIG with max of 999 that I keyed in, not understanding what it all means personally as I have never gambled, buy a lottery or even buy shares in the stock market! I know several people who lost all they had involved heavily in one of the above! Now even though the miracles of Anthony's life has nothing to do with the actual number of 7, which is what my Story of 7 was about when I first started it, I had later changed the criteria of what stories would qualify to be in that special blog post. I will now continue the celebration of his life in the Story of 7 post found here.